Chacon, R.; Sanchez-Juny, M.; Real, E.; Gironella, X.; Puigagut, J.; Ledesma, A. Digital twins are understood as digital replica of physical models whose behavior can be observed simultaneously (digitally and physically) in real time. These tools are increasingly used in advanced industries for several purposes. The digital representation provides both the elements and the dynamics of how an Internet of Things (IoT) device operates and lives throughout its life cycle. Despite its complexity, the materialization of these digital artifacts in their simplest form imply the use of a threefold technology: sensors, data acquisition systems (DAS) and graphical user interfaces (GUI). 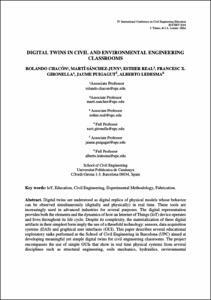 This paper describes several educational exploratory tasks performed at the School of Civil Engineering in Barcelona (UPC) aimed at developing meaningful yet simple digital twins for civil engineering classrooms. The project encompasses the use of simple GUIs that show in real time physical systems from several disciplines such as structural engineering, soils mechanics, hydraulics, environmental engineering, coastal engineering or structural dynamics. The project has shown potential for civil engineering classrooms at two levels: i) these portable tools can be used pedagogically for demonstrating key concepts with a high degree of interactivity, ii) the development of these artifacts (from sensors to GUIs) may provide a key understanding of several concepts associated with IoT mechanics for civil engineering students. It is noteworthy that nowadays, average students are seldom acquainted with sensors, electronics and virtualization of physical magnitudes at Bachelor and Master level. IoT technologies will be needed in civil engineering classrooms in the following years due to the increasing trends related to automation, monitoring and digitalization that the construction industry will undertake. Experimental and numerical pedagogical activities may be enriched with this concept since they allow navigating from physical to virtual realms and vice versa. The paper includes several examples with real applications as well as some recommendations for its potential application. Chacon, R., Sanchez-Juny, M., Real, E., Gironella, X., Puigagut, J., Ledesma, A. Digital twins in civil and environmental engineering classrooms. A: International Conference on Civil Engineering Education. "EUCEET 2018: 4th International Conference on Civil Engineering Education: Challenges for the Third Millennium". Barcelona: International Centre for Numerical Methods in Engineering (CIMNE), 2018, p. 1-10.